Groundhog Day is almost here and the Weather Discovery Center is ready to welcome you! 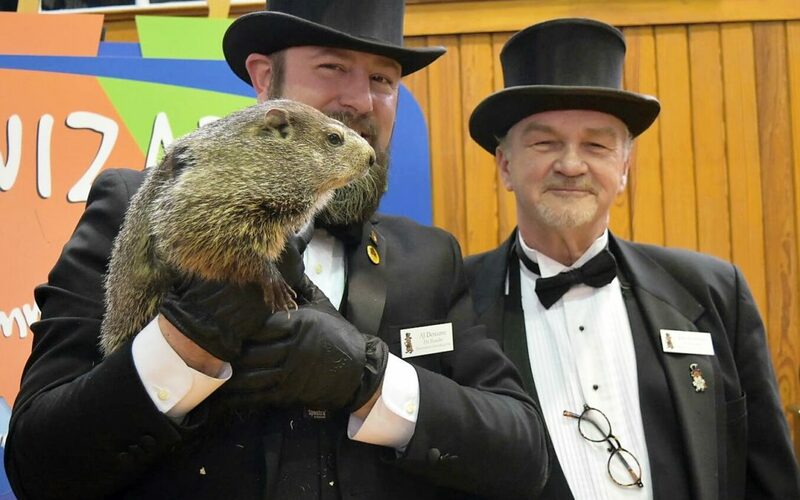 Being witness to Punxsutawney Phil making his annual prognostication in the early morning hours of February 2 is a unique, small town experience that everyone should have in their lifetime. But braving the cold at Gobblers Knob is just one part of the three-day Groundhog Day celebration. Beginning on Friday, Feb. 1 (known to the locals as “Groundhog Eve”) and continuing through Sunday, Feb. 3, there are events, shows, and fun throughout the community. The Punxsutawney Weather Discovery Center throws open its doors for extra hours during the three days featuring our fun, interactive exhibits about weather and weather folklore. Give our scavenger hunt activity a try and win a prize if you find all of the answers. In our classroom, kids can do an easy make-n-take craft as a souvenir of their visit to Punxsutawney. And if you like celebrity meteorologists, be on hand for our Meteorologist Hall of Fame induction ceremony to see The Weather Channel’s Jen Carfagno as she is honored as our 2019 Hall of Fame inductee! Friday, Feb. 1, Open 10 a.m. – 7 p.m. Enjoy fun and interactive exhibits about weather and folklore. Give our scavenger hunt a try and do a make-n-take activity in our classroom. Admission is $7 per person, children 2 and under free. See The Weather Channel’s Jen Carfagno be inducted into the Hall of Fame. Begins at 11:30 a.m. with cookies & punch and a chance to meet Punxsutawney Phil followed by the induction ceremony at noon. $7 per person admission, children 2 & under free. Saturday, Feb. 2, Open 8 a.m. – 6 p.m. Enjoy fun and interactive exhibits about weather and folklore. Give our scavenger hunt a try and do a make-n-take activity in our classroom. Admission is $7 per person, children 2 and under free. Sunday, Feb. 3, Open 9 a.m. – 2 p.m. Enjoy fun and interactive exhibits about weather and folklore. Give our scavenger hunt a try and do a make-n-take activity in our classroom. Admission is $7 per person, children 2 and under free.